The Djembe belongs to the family of drums with an ethnic and culturally rich design of its own. 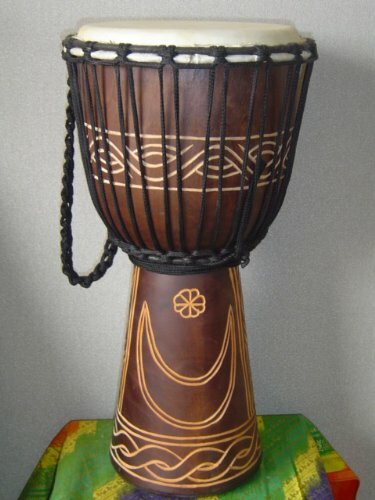 Originating from West Africa, this is a popular percussion instrument in drum circles and is often used for decorative purposes owing to its unique design and style. The distinctive name of the instrument is inspired by the saying “Anke djé, anke bé” meaning “everyone together in peace”. Djembes have a traditional look and feel. They are tuned via ropes but many advanced designs now come auto-tuned without ropes. 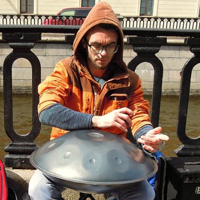 It is played with bare hands by percussing on the drum heads to produce a variety of slap and bass tones. Meinl Djembe will give you a rustic and traditional vibe with modern tunes and a great sound range. The Remo Djembe is elegantly crafted with intricate detail and user friendly features. This elegant djembe is a poised blend of dynamic range of tones along with inspiring quality and classy design. Enjoy the simple and classy African Djembe imported directly from its homeland. The hand carved beginner Djembe is created by experienced artisans and is a part of the African Heartwood Project. A lot of thought and consideration goes into the choosing of a musical instrument that compliments your style. Djembes are a unique variety of drums that can have variable sizes, playability and quality. The most important thing to consider when purchasing a djembe is its craftsmanship and durability. Different head diameters and tuning methods also vary depending on the brand and manufacturing process of the instrument. Smaller and auto tuned versions of the instrument are great for beginners and young adults, whereas an authentic, full sized and rope tuned djembe is a great addition to a professional band with an experienced player. You should also look into the type of wood used for the djembe and the skin quality of the drum heads as it effects the sound quality and adds to the appeal of the percussion instrument. Here are some of the best djembes available online with competent features and a good bang for your buck. When it comes to the brand, I find Meinl to be a reliable one so you can be sure of its quality and durability. 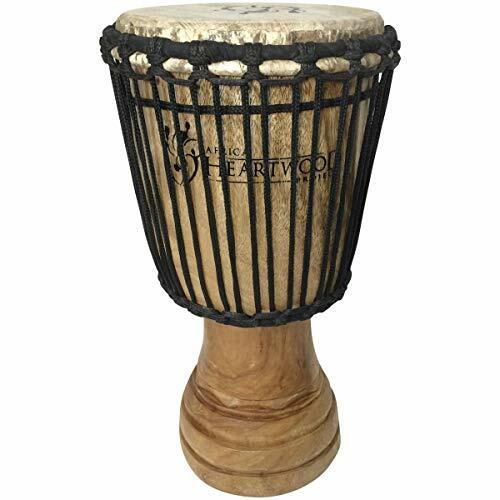 This mahogany wood djembe has exceptional acoustic properties and performs well in a wide range of tones. I was intrigued by its intricate design, with hand carvings and horizontal ripple motif on the Mahogany shells that resembles a flowing river. The goat heads are hand selected and feature a Mali Weave system made with nylon. It is easy to use and doesn’t require fine tuning. The length of the instrument makes it easier to play in the traditional style. I’m fairly satisfied by its performance with tunes ranging from deep and resonating bas notes to high pitched, cutting slaps. The beautiful design gives a traditional and rustic vibe that plays well in studio and live shows when placed directly under the microphone. The head is quite sensitive and responsive. It produces good quality djembe sounds that have a warm yet sharp and cutting tone. When played at the center, the djembe produces a boom bass sound, and when slapped at the edges, it gives a sharp and popping accents. It is a great instrument to play in drum circles, jam session or live shows. It fits well between legs and the length is tall enough to keep a good posture while playing. The product comes with 2 years warranty and is backed up with a devoted customer service. Remo Djembes are quite popular and I was excited to get my hands on them. They have a classy and trendy design, pleasing outlook and they ensure good performance with reliability and durability. In my opinion, their current model holds true to their standards and doesn’t disappoint in terms of design, efficiency and quality. The djembe comes key tuned and is quite easy to use. It has a Skyndeep Fiberskun drumhead and Acousticon shell, and let’s admit it, the fancy named features add to the appeal. It comes with 8 tuning lugs and has an Earthy, simple design with elegant patterns and Fabfurnish covering. What I liked the most about this djembe is its versatility, as it fit for all drumming styles and skill levels. It is great for beginners as it is quite simple to use with easy playability and remarkable performance. The djembe offers a wide range of tuning. It can produce warm notes and rich bass, along with very finely defined slap notes. It is better suited for those who find this tuning process difficult. 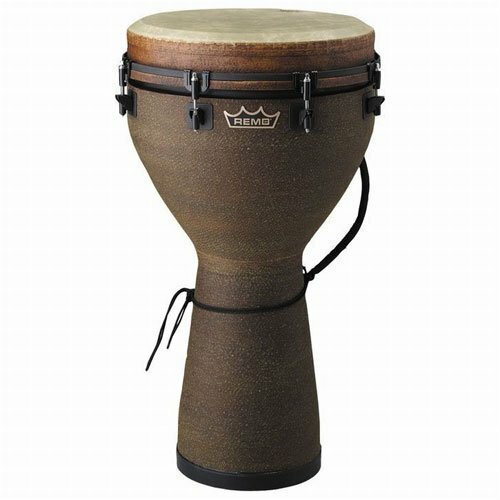 Although this classic Djembe is more towards the pricier end, its quality, ease of use and performance makes it a great investment. It has a decent and classy appearance that adds to its appeal and charm. 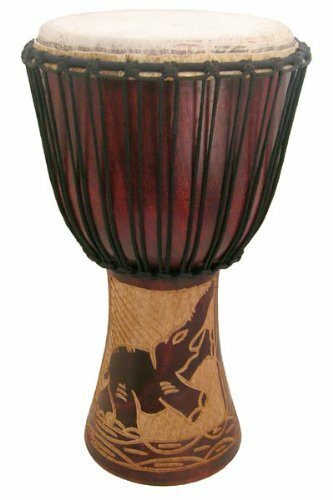 The Djembe is crafted with environmentally stable and legally harvested Mahogany wood that has a solid, one-piece shell construction. When I saw the skillfully crafted African patterns of moon and stars around its wood body, it was love at first sight. The tuning system can be a bit tricky with this product. The 5mm non stretch alpine rope in internally braided for tuning and an extra tuning rope is wrapped around the neck for Mali Weave tuning. You need to be on a certain skill level to tune this djembe. 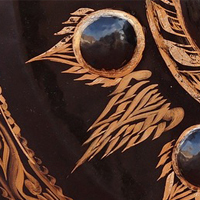 The beautiful hand carved African Djembe drum has a traditional and rich look that depicts its cultural beauty. It is fairly light in weight and very easy to use and carry around. I’d say that this djembe has more of an aesthetic appeal that overpowers its functionality, and therefore it is great for decorative purposes or to be practiced on by kids. It is also good for beginners. It has a natural goatskin construction with hand carvings and a good quality wood shell that’s sturdy and robust. The great thing about it is that is comes fully tuned and ready to use right out of the box. It can also be tuned with the help of ropes if required. 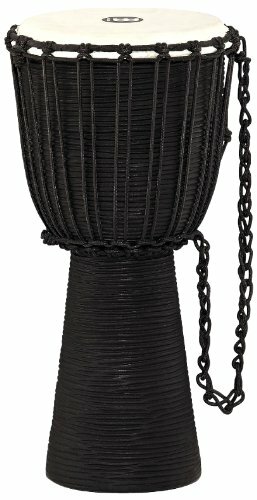 This simple and classy djembe stays true to the djembes used in West Africa. The attractive and beautiful instrument is handcrafted with care by the experienced artisans in West Africa. You can play high tonal notes on it. It can be used in place of a bongo, or if tuned high, it can also be used in place of a dumbek. It won’t give you a wide range of sounds though, so if you are looking for a professional level of functionality, this isn’t the one for you. I’d call this a ‘native’ Djembe, as it is made in Africa, by African players, for African novice players. It has an exotic African look with wood carvings. The hand carved shell is solid and sturdy. The drum head have genuine goatskin covering and the instrument is pre tuned which makes it great for beginners as it comes ready to be played right out of the box. This djembe is a smart choice for beginners as it comes already tuned and is quite easy to play. It is built with care and precision by adept and experienced artisans. The look is quite elegant and reminds you of its cultural beauty with Earthy handcrafted patterns and designs to beautify the body of the instrument. Use it to practice and learn until you are ready for a more complexed, rope-tuned version of the product. Picking out the djembe that is best for you depends on your skill level. You can get a small one with an exotic design and carvings just for decoration but these beauties play wonderfully and should be used for the pleasant musical experience they provide. Looking for some other great percussion instruments? Check out our articles on cajons, hang drums, and steel tongue drums!